Last night we ventured to the school athletic field to tackle some evening exercise. I finish cleaning up from dinner while my wife and son got a head start. After loading up the last dish in the dishwasher, I changed my clothes, grabbed my Ipod and hit the track. I have not been keeping to any sort of regular exercise schedule for the last couple of months and decided this week to really buckle down and "Just Do It". My son needs to get in some exercise also and I think we need to formulate a father-son program. Usually when my son and I hit the field, we play catch or I throw the lacrosse ball to him while he sort of runs around, not an efficient workout. 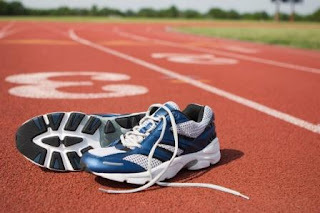 Last night I just hit the track and started running. My son was walking around the track with my wife and he noticed me coming towards them, in a jog while listening to some tunes. I passes him, but instead of stopping, kept on running, not allowing myself to idle. As I rounded turn four and into my second lap, I looked back to see my son striding along in a light trot. I glance back in the middle of second lap and he is still running along in good form and determined to complete the lap before slowing down to a short walk. I pass him once again and give him a high five and he smiles. I go a little more down the track when I hear footsteps from behind. I turn my head slightly to peak back and see my son, running along, keeping a steady pace. By then end of our routine, my son ran, walked and ran some more to complete five laps! As happy as I was with my completion of nine laps, I was even more ecstatic with the influence it made on my son. If we can both keep this up we will be in great shape, not only for the summer, but for our health.